Dr. David Elton Trueblood, author, educator, philosopher, and theologian was a lifelong member of the Religious Society of Friends (Quakers). Elton Trueblood influenced the lives of many people in the United States and abroad. His position as professor of philosophy at Earlham College enabled him to reach a wide audience through teaching, speaking and writing. In mid-life he found an entry in the journal he kept during college which said, " I don't know what I should be: an educator, writer or preacher." this indecision was resolved by success in all three areas. Elton Trueblood's English Quaker ancestors settled on the coast of North Carolina in 1682 at the site of the present town of Elizabeth City. In 1815 a large Quaker group, including the Trueblood's, emigrated to Washington County, Indiana, to become a vital part of a new Friends community. In 1869 Elton Trueblood's grandfather and other members of the family moved to Warren County, Iowa, where he was born on a small farm near Indianola on December 12, 1900, the son of Samuel and Effie Trueblood. Molded by the close-knit Quaker community, hard work on the family farm and excellent teachers, Elton Trueblood showed great promise even before college. He graduated from William Penn College, Oskaloosa, Iowa, in 1922, winning praise as an outstanding student, debater, and football player. After preliminary graduate studies at Brown University and Hartford Theological Seminary he earned a graduate degree of bachelor of systematic theology at Harvard University in 1926 and a PhD in philosophy from Johns Hopkins University in 1934. He soon found his career in the academic world. His first teaching assignments were at two Friends institutions, Guilford College in Greensboro, North Carolina, and Haverford College near Philadelphia. In 1936, largely as a result of a 1935 summer appointment as acting chaplain at Harvard, he became chaplain at Stanford University in Palo Alto, California. Elton Trueblood's years of public service and literary success began during his tenure at Stanford from 1936 through 1945. Stanford provided the public visibility and financial freedom that made a national ministry possible. During the Stanford years Elton Trueblood was drawn into friendships with a number of distinguished and celebrated individuals. Stanford had a generous budget for guest speakers in the Stanford Chapel, and these visiting theologians were often guests in the Trueblood home. This was a source of intellectual stimulation for the entire family. Former president Herbert Hoover and his wife, Lou Henry Hoover, were close neighbors and often attended the Friends Meeting for Worship held monthly in the Trueblood home. As a result of this friendship, Elton Trueblood conducted services for both of the Hoovers after their deaths, including Mr. Hoover's public burial before a crowd of 75,000 on a hillside overlooking the Hoover Presidential Library and Museum in West Branch, Iowa. In 1945 he felt a strong calling to a public ministry through writing and speaking, and also a desire to serve a small Quaker liberal arts college. This led him to leave his tenured full professorship at Stanford to go to Earlham College in Richmond, Indiana, as a professor of philosophy. 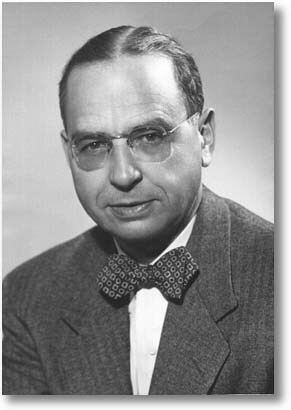 Earlham's struggle to rebuild after the impoverishing years of World War II was aided by the arrival of strong new leadership including Elton Trueblood. He explained his reasons for this apparently illogical career move in a much-reprinted Reader's Digest article, "Why I Chose a Small College." His exceptional skills and his national recognition helped increase public application of Earlham and hundreds of other church-related and independent colleges across America. He saw them as superior places for undergraduate education, where teaching was emphasized and where close faculty-student relationships could be naturally fostered - strong interests for him as a gifted classroom teacher. The Earlham years were the most productive years of his long life. During this time the college prospered, receiving national recognition as one of the best liberal arts colleges in the country. He worked closely with five presidents of the college helping to attract young faculty. As time passed at Earlham he and others became more and more aware of the need for a Quaker seminary. Friends churches were hiring pastors either with training from other denominational seminaries or else with nothing more than a college degree with a religion major. Unprogrammed Friends meetings often hired staff with no theological training. He saw a need for a seminary that would train young Friends for service to the Society of Friends in both programmed and unprogrammed traditions. Funds were limited and the college had many other priorities, but finally the Earlham School of Religion was opened in 1960. Today the school is thriving and serving all branches of the Society of Friends. Upon his retirement from Earlham in 1966 Elton Trueblood was named "professor at large," a position he held until his death. He built a home on the campus where he lived until 1988. During these years he enjoyed the role of counselor and encourager to faculty, students, and others who came to visit him at his home or in Teague Library next door. He particularly enjoyed helping young writers through constructive criticism and encouragement. Many educators, writers, pastors, and business people recount stories of the significant role Elton Trueblood played in their careers. The first six of his 33 books (those written before 1943) were directed principally at theologians, philosophers, and other academics. In 1944, with the horrors of World War II increasingly shaking the lives and beliefs of millions,, Elton Trueblood produced a slender, provocative by popular volume, entitled The Predicament of Modern Man. In it he decried "the failure of the power culture" and warned against the dangers of what he called "our cut-flower civilization." Although dealing with sober and profound issues concerning the future of human society, it was written in simple, easily understood language and it gained a broad and responsive audience. Avoiding simplistic admonitions for a "back to the church" or "back to the Bible" movement, he called for the reinvigoration of religious faith as the essential force necessary to sustain the ethical, moral, and social principles on which a humane and livable world order could be built. He warned against what he called "churchianity" and "vague religiosity," but he also cautioned against the overly optimistic expectations of secular social-reformism. Through his extensive speaking and in subsequent books he proposed the creation of a broadly-based ecumenical "fellowship of the committed" that should transcend denominational differences and work for spiritual renewal and the transformation of society, both from within and outside the church. Lay activists he saw as an essential for strengthening spiritual values within the broader society. These concerns led him to found the Yokefellow movement, resulting in establishment of Yokefellow retreat houses across America and in several foreign countries. The movement included a special "ministry to prisons," leading to the development of several halfway houses. Clergy and laity from a number of Christian denominations joined in these endeavors, highly decentralized and noncreedal. For many years he was involved in the management of these activities through Yokefellows International and through an annual international conference held on the Earlham College campus. As public speaker and author Elton Trueblood was an advocate for simplicity, clarity, and brevity. He looked his audience straight in the eye, speaking without manuscript or notes, yet his words came out in carefully crafted and vivid sentences and paragraphs. He generally limited his sermons to 20 minutes. He could close a session on the minute without using a timepiece. He once said, "If you want people to come hear you, you must stop on time." He came to feel that any book with a serious message and with any hope of significant impact on its readers should be limited to about 130 pages. He generally followed his own prescription. To his editors at Harper and Row he was a delight to work with, always turning in clean copy that required little editing, that was delivered on or before the deadline and which appealed to a diverse and numerous audience. As literary masters after whom he patterned his style he claimed Blaise Pascal, Dr. Samuel Johnson, Abraham Lincoln, and C. S. Lewis. He admired their skills in treating serious subjects with ample use of aphorisms, anecdotes and humor. When he once asked the eminent theologian Reinhold Niebuhr who he though was the most original thinker in American history, he received and immediate and unexpected reply. "Abraham Lincoln." As a result, Elton Trueblood researched and eventually wrote Abraham Lincoln: Theologian of American Anguish. More than one president has now read and quoted from it. Elton Trueblood was not a believer in a narrow interpretation of the supposed "wall of separation" between religion and politics. Although never the house-guest intimate of presidents the way his friend Billy Graham was, he had some familiarity with the White House through visits there with several presidents, Democrats and Republicans. He drafted several presidential proclamations dealing with religion, including Thanksgiving Day proclamations. He served the Eisenhower administration as Chief of Religious Policy for the U.S. Information Agency, spoke at a national Republican convention, delivered prayers at the opening of various Congressional sessions and addressed one of the annual presidential prayer breakfasts. Throughout his life he had extensive contacts with leaders in government and business, as well as with those in religion and education. His popularity as a public speaker was such that he could easily have devoted all of his time to the well-paying lecture circuit. Instead, he limited his speaking engagements to those audiences he wished to reach or help, thereby leaving time for teaching and family. He spoke without fee for those who could not afford it, but charged the standard amount for those who could. He usually included his expenses in his fee, since he had found that it often took more time to prepare an expense account than to write a speech. He never charged a reduced fee, saying "I don't want anyone to think that I am a fifty-dollar speaker." Although he served on many committees of the Religious Society of Friends, his views were not always consistent with Friends' thinking. His generally strong pro-Republican views, and his strong anti-communism caused discomfort to some of the more socially active segments of Friends. He avoided the terms "conservative" and "liberal," finding each simplistic and divisive. He believed that the Society of Friends, though a small denomination, was big enough for widely divergent points of view. Although as a young man he tended toward near Unitarianism, over the years he became a spokesman for what he considered "rational evangelism." Like C. S. Lewis and his friend Malcolm Muggeridge, he moved more and more into the mainstream of Christian orthodoxy, but gave his own interpretations of the beliefs he embraced. He preferred not to involved himself in disputation over fine points of doctrinal difference. Emphatically, he would not identify himself with the radical Religious Right. Precise labeling of Elton Trueblood was difficult. He liked to say that the most important word in the language was "and." On many matters of controversy he would insist, "we have to say both - and - together, not either - or." By word and action he demonstrated what some saw as contradictory beliefs and habits; liberal and conservative, traditional and innovative, compassionate and tough-minded, generous and demanding. He saw this as being human, trying to be realistic and honest. From his abolitionist Quaker heritage and his own sense of moral and religious imperatives, he drew strength from vigorous opposition to racial discrimination. He was an early friend and supporter of Dr. Martin Luther King, Jr. At crucial points in the civil rights struggle he made direct and personal appeals to both President Eisenhower and President Nixon that they hold strong stands for public policies to eliminate all forms of racial discrimination and to advance equality in human rights. On another central Quaker testimony, pacifism, he was clear as to the importance and complexity of the issue. He struggled openly over the personal dilemma of how government can effectively stand against tyranny. He wrote and spoke eloquently against war, for international reconciliation and in support of the rights of conscience for objectors to military service. He emphasized that non-violent way should be central to human relations and ongoing international policy. If a government does not successfully practice peaceful relations with its neighbors, then it will be faced with a choice among evils in times of crisis. During World War II he reluctantly concluded that military resistance was necessary. His emphasis in his books on the importance of family life was not theoretical but was a reflection of his role as husband and father. He and Pauline Goodenow had met while at William Penn College, and they were married in 1924. During their early years two sons were born, Martin, in 1925 and Arnold in 1930. Two more children came later, Samuel in 1938 and Elizabeth in 1941. Elton's children remember him as a loving and devoted father who found ways to be available to is children in spite of his heavy speaking schedule. He did not want his children to pay a heavy price for his public ministry. Tragedy struck the family in the fall of 1954 when it was discovered that Pauline Trueblood was suffering from an inoperable brain tumor. The family was still in the process of moving to Washington D. C. at the start of Elton's work with the USIA, when it became clear that something was seriously wrong. Somehow he was able to care for the two younger children still at home, tend his sick wife, and start a new job. Pauline had been an inspiration to him, providing needed criticism of what he wrote, pushing him to fulfill his opportunities for a national ministry, and managing the household as well as she could in spite of years of chronic illness. She died early in 1955. Virginia Hodgin, a widow with two children, had become his secretary in 1950 and had moved to Washington to served in the same capacity at USIA. In September 1956, Elton and Virginia were married at the Washington National Cathedral with both families in attendance. Virginia proved to be a valuable partner as well as wife. With her help he was able to publish 17 books in the next 18 years, ending with his autobiography, While It Is Day, in 1974. Virginia died in 1984. In 1988 he felt the need to move closer to his children in the Philadelphia area and into a protective environment. He chose Meadowood, a continuing care retirement community near Norristown sponsored by members of the Schwenkfelder Church. His life at Meadowood was full and rewarding. He soon organized a weekly prayer meeting and invited guest leaders. To his great joy, a constant stream of admirers and former colleagues visited him at Meadowood. He missed his beloved Earlham, but the many visits from children and grandchildren became the highlight of the last chapter of his life. Among many other qualities, Elton Trueblood should be remembered for his personal discipline which made his high productivity possible. He believed in living his life in chapters, and when a new chapter started he never wasted energy looking backward. During his most productive years he rigorously divided his day into periods of meditation, writing, exercise, and family life. He wrote most of his books in a small cabin at the family summer home in the Pocono Mountains of Pennsylvania during the summer break at Earlham. He would contract to deliver the manuscript on Labor Day and then begin writing the Monday after the Fourth of July. He wrote between 8:00 a.m. and noon, Monday through Friday. He often said, paraphrasing Mark Twain, that the way to write is to apply the seat of your trousers to your chair and pick up your pen without waiting for inspiration. Those who loved him remember him as never complaining about his own problems - he took what life brought and either accepted it or changed it. He loved humor, and gave his children a heritage of many wonderfully funny stories. "Elton was one of this century's most remarkable interpreters of the Christian faith," said Earlham President Richard Wood. "He was a Quaker with a genuine ecumenical vision of the Church and its mission in the world. Fundamental to this vision was his conviction that deep faith and rigorous intellect require each other, a conviction that he lived." This article, written by former Earlham president Landrum Bolling, was reprinted with permission from the Winter 1995 edition of Earlhamite. Oliver P. Morton, who served as the 14th Governor of Indiana during the American Civil War, was a Wayne County native. His family home still stands along the National Road on the west side of Centerville.